Superb illustrations accompany fascinating tidbits about weather and the world in this lovely, distinctive book. 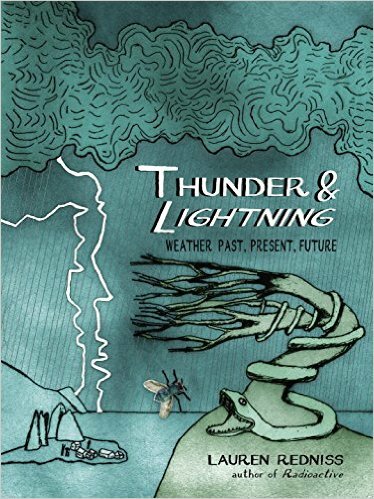 Lauren Redniss (Radioactive) offers a gorgeously rendered and singular piece of work with Thunder & Lightning: Weather Past, Present, Future. Her original artwork is stunning, dreamy and evocative, the perfect complement to facts about weather and carefully selected interview excerpts and quotations. Redniss’s “Note on the Art” describes her media: copper plate photogravure etchings and photopolymer process prints, hand-colored, and a few drawings in oil pastel. She comments on the artistic tradition that inspired her: artist/scientists whose devotion to precision and accuracy have historically paired with “a sensation of strangeness, wonder, terror.” Her work is certainly worthy of that tradition; drawings of wildfires recall Picasso’s Guernica, and the chapter entitled “Sky” contains only striking illustrations and no text. These drawings are both otherworldly and very much of our world. Redniss’s text, based on scientific research and cultural traditions, riffs on weather phenomena rather than offering a comprehensive study. Her chapters cover conditions (cold, rain, heat, fog) as well as concepts (dominion, war, profit), and span the planet and various peoples throughout history. She considers weather that has been blamed on witches or credited to gods; the use of cloud seeding as a weapon by the United States against Vietnam; and weather derivatives and insurance. Redniss’s subjects are quirky and entertaining; her chapter “Forecast” is as concerned with the Old Farmer’s Almanac as with the National Oceanic and Atmospheric Administration. That tone of marvel and whimsy, plus exquisite illustrations, make Thunder & Lightning both remarkably beautiful and pleasingly informative. This review originally ran in the November 10, 2015 issue of Shelf Awareness for Readers. To subscribe, click here, and you’ll receive two issues per week of book reviews and other bookish fun! Rating: 8 gorgeous interpretive hand-colored prints.